Giampiero Moretti, a motor racing enthusiast who made his fortune almost literally by reinventing the wheel, was born on this day in 1940 in Milan. Known as 'the last of the gentleman racers' because of his unfailing courtesy, refined manners and an unquenchable determination to succeed on the track, Moretti made a profound mark on the sport through his ergonomic rethink of the racecar steering wheel. Steering wheels were traditionally large and made of steel or polished wood but Moretti saw that reducing the diameter of the wheel would cut the effort needed by the driver to steer the car, helping him conserve energy and creating a more comfortable driving position. He also covered the wheel with leather to improve the driver's grip, and gave it a contoured surface. He made the first one for a car he planned to race himself and there was soon interest among other drivers and he began to make more wheels. His big break came when Ferrari invited him to design a leather wheel for their Formula One car. 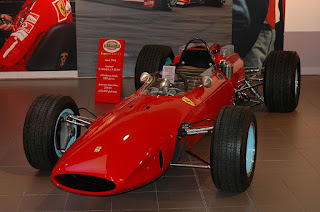 Enzo Ferrari himself was a traditionalist who took some persuading that the tried-and-tested old steering wheel was not the best but when his drivers took to it with such enthusiasm he sanctioned its installation in the new Ferrari 158 that John Surtees was to drive in the 1964 F1 season. Surtees loved it and, as it happened, won his only F1 world title that year, his victories in the German and Italian Grand Prix enabling him to pip his fellow British driver Graham Hill by one point. Ferrari was sold on Moretti's innovative skills and decided he wanted his steering wheel on all Ferrari cars. On the back of this encouragement, Moretti acquired a small factory premises near Verona and set up the company, Momo (an amalgam of the first two letters of Moretti and of Monza, the Italian race track), of which Ferrari was the principal client. Eventually, the company expanded its lines to include helmets, shift knobs, road wheels, fireproof driving suits, gloves and shoes, and branched out into sponsorship and team ownership. Although Moretti sold the company in 1996, its red and yellow logo is still familiar today. Born into a wealthy Milanese family who owned a large pharmaceuticals business, Moretti caught the racing bug when he was studying for his political science degree at the University of Pavia and soon began taking part in sports car events. Although he won from time to time, it was an expensive hobby and it was part to finance his racing without relying on his family's support that he launched his business. It enabled him to continue to pursue his ultimate dream, which was to win the 24 Hours of Daytona, the prestigous endurance sports car race that takes place in Florida each year. 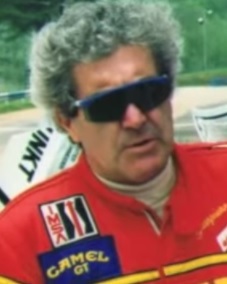 Having been a fixture at Daytona for many years, racing Porsches and Ferraris and developing close friendships with movie actors such as Gene Hackman and Paul Newman, for whom he would often could pasta dishes in his motorhome, Moretti finally could call himself a winner in 1998, at the 15th attempt. In their Ferrari 333sp - a car Moretti had persuaded Ferrari to develop specifically to race in the United States - Moretti and his co-drivers, Arie Luyendyk, Didier Theys and Mauro Baldi, recovered from 18 laps behind to take the lead in the final three hours, with Moretti at the wheel to take the chequered flag. 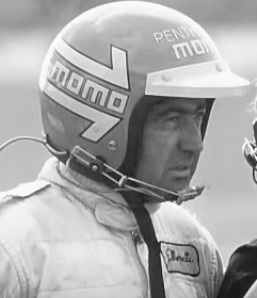 Amazingly, the team also won the 12 Hours of Sebring only a couple of months later, while Moretti partnered another Italian driver, Massimiliano "Mad Max" Papis to win the Six Hours of Watkins Glen, making Moretti the only driver to win all three events in the same year. Moretti, who never married but had two sons, Matteo and Marco, died in Milan in 2012, at the age of 71. Moretti established his first factory at Tregnano, a small town outside Verona that for many years enjoyed a thriving economy due to the establishment of a cement factory that at its peak supplied the cement that went into the Ponte della Libertà, the road bridge linking Venice with the mainland that was opened in 1933. Although the factory closed in 1973, the factory's tall chimneys still exist. 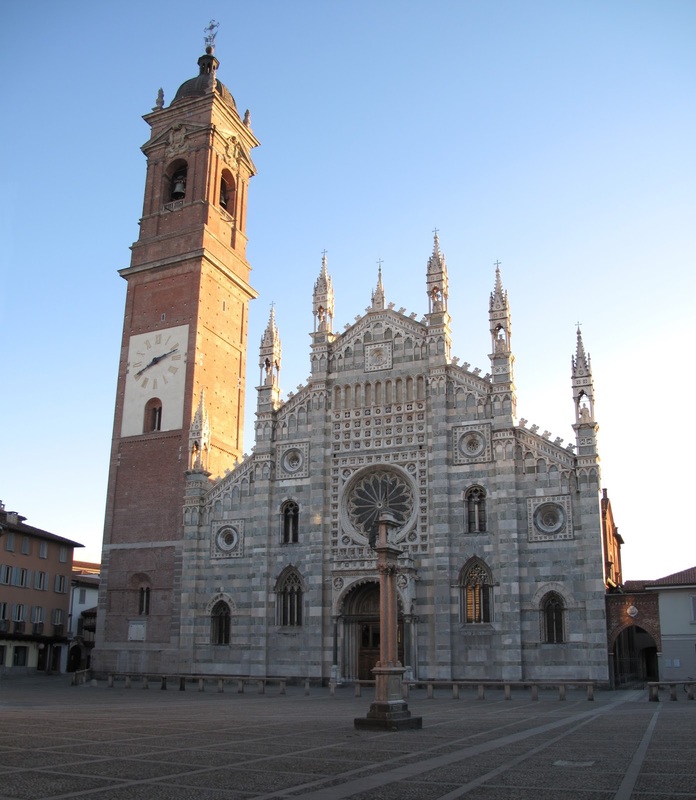 Notable buildings include the 15th century parish church of Santa Maria Assunta and the remains of a castle built between the 11th and 12th centuries. Monza, which is situated about 18km (11 miles) north of Milan, is best known as the home of the Italian Grand Prix, and while the racing circuit within the Parco di Monza to the north of the town attracts thousands of visitors, the town itself is often passed by, despite many historic buildings. These include a beautiful Duomo completed in 1681 with a Baroque facade decorated in Gothic style, the 14th century Arengario civic palace, a magnificent 18th century Royal Villa, designed by Giuseppe Piermarini (of Teatro alla Scala fame) and the Ponte dei Leoni, a bridge of Roman origin.